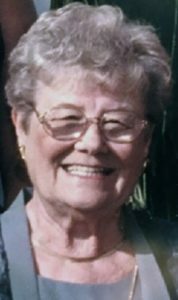 Georgette M. Rhinier, 91, of Lancaster, passed away peacefully after a brief illness on Sunday, January 20, 2019 at Conestoga View Nursing Home. She was the loving wife of the late Frederick “Peck” Rhinier. Born in Lancaster, she was a daughter to the late George Rittenhouse and Elva (Brooks) Rittenhouse Shenk. Georgette was a member of St. Mary’s Catholic Church in Lancaster. She will be remembered as a loving wife, mother, grandmother and great grandmother that was devoted to her family and who worked hard to provide for them over the years. Throughout her adult life she was employed with Schick, RCA and Bulova. Her family will miss her amazing abilities to bake desserts, especially her “famous” peanut butter balls. She is survived by her daughters: Bonita Bowman, wife of Richard of Lancaster, Colleen Watson, wife of Richard, Jr. of Lancaster; sisters, Betty Wise of Lancaster, Roxanne Galeschewski of Lancaster; four grandchildren, seven great grandchildren and many loving nieces and nephews. In addition to her husband and parents she was preceded in death by a sister, Nancy Urban and her brother Charles Rittenhouse. There will be a Mass of Christian Burial on Wednesday, January 30 at 10am at St. Mary’s Catholic Church, 119 S. Prince Street, Lancaster. The family will receive guests from 9am until the time of Mass at Church. Interment will follow at Conestoga Memorial Park. In lieu of flowers, memorial contributions may be made to: Vision Corps, 244 N Queen Street, Lancaster, PA 17603 or by visiting: visioncorps.net. The family would like to extend their deepest gratitude for the care that was given to Georgette while at Conestoga View Nursing Home. We met Georgette when my mother in law was sent to Conestoga View in August. She was such a sweet lady and looked out for everyone in her room. We took her birthday presents and when my mother in law passed away in Sept promised her and Lydia her roommate we’d be back to visit. We returned before Christmas with flowers and cookies. Georgette was thrilled to tears and took pictures of is on her cell phone. She was such a dear sweet woman with wonderful stories of her family. I’m sorry we never got to meet them and I know she will greatly missed by them. She truly was and is an angel. I only met this beautiful lady last year when she befriended my grandmother as her roommate. Almost every visit with grandmother was spent also with Georgette. We loved chatting with her, listening to her stories and best of all my grandmother adored her which meant alot to our family. I’m sorry for the families loss as she will be missed dearly. Bonnie and Colleen, Shirley and I are so sorry for your loss. Your mom held a special place in our hearts.Shirley and Ron spoke so highly of your parents,she will be missed by you all. Our prayers are with you. Sue Ryan. Colleen and Rick, All of us at GSM Roofing extend our deepest sympathies along with including your family in our thoughts and prayers. So very sorry, Bonnie and Colleen and all of your family. What an amazing person Georgette was. Truly a wonderful woman. God bless the family.